There’s wacky world of choc news to spare this week, with three stories just itching to be told. 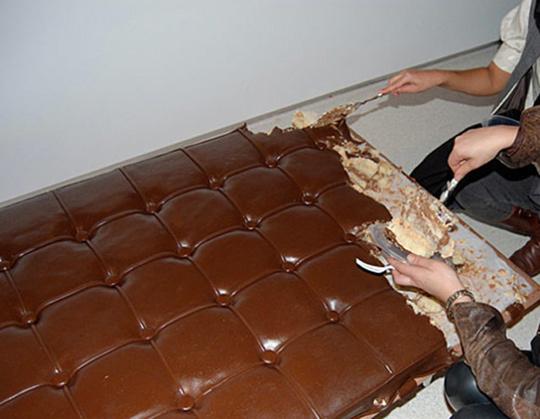 First, Leandro Erlich’s sofa made out of cake (and frosted with chocolate – ooh la la!) made headlines here, here, here, and there. 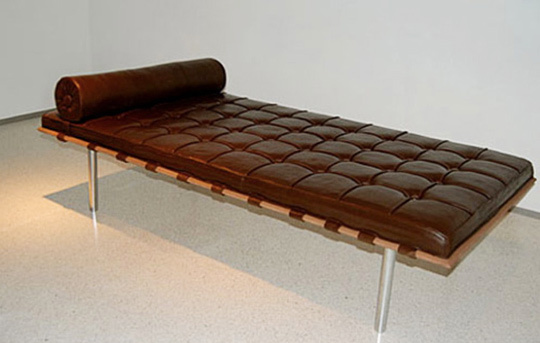 The cake sofa, a replica of Mies van der Rohe’s Barcelona couch, was exhibited at New York’s Haunch of Venison gallery. The chocolate crafting is extraordinary – the pleats, buttons, and upholstery look just like leather. Of course all good cake sofas must eventually be eaten. Second, Australian chocolatier Darrell Lea recently teamed up with ice sculptor Kenji Ogawa to produce three chocolate busts of famous Aussie dads. The busts are equal parts fun and weird. 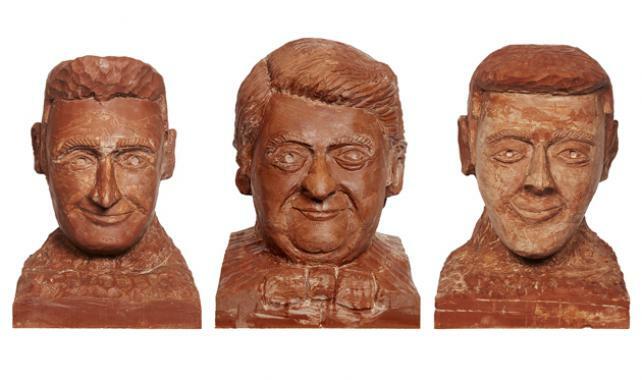 … a trio of one-of-a-kind, life-size chocolate replica busts in the likeness of celebrity fathers 7PM Project presenter and comedian Dave Hughes, TODAY Show host and genius MC Karl Stefanovic and professional masticator Matt Preston. Third, soap opera blogs erupted with commentary on what was perceived as blatant, shameless product placement on a recent episode of ABC’s General Hospital. A scene featured two major characters discussing their love of Hershey’s Chocolate Syrup and clink-clinking glasses of chocolate milk in a special toast. As one commentator put it, “Not so surprisingly, the first commercial to run after that scene was for Hershey’s Chocolate Syrup.” To read a detailed description of the scene, see the full post. If you’d like to watch and judge for yourself, here’s a video. The scene in question starts at 01:18 and ends at 02:43. Given chocolate milk’s current embattled state in public schools, this is a product placement worth thinking about.